The most successful Ghanaian traditional artiste, King Ayisoba has shared photos of his late mum’s burial. 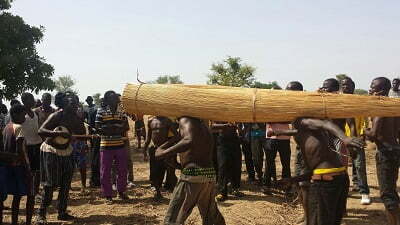 King Ayisoba who confirmed the death of his late mother called Akupoka Apoore to hotfmonlinegh.com on Wednesday, was spotted performing whiles the mortal remains of his late mother was being wrapped in a local mat and carried on the shoulders of two well built men to the cemetery for interment. King Ayisoba’s mother ,Akupoka Apoore who was 85yrs old died on 2nd May,2016 after a short illness at home after being discharged from the Bongo district hospital in the Upper-East Region.